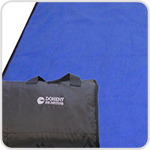 Our fleece picnic blanket is the perfect choice for your next sporting event. Double web carry straps make it perfect for travel. TO ORDER IN BULK AT A DISCOUNTED PRICE, SEE OUR WHOLESALE FLEECE PRODUCTS.